I used to be a person who loved going to shopping malls, even if just for window shopping; now, one would have to lock me up in a straight jacket to get me into a mall without a very specific purpose – and lately, going to the movies has been the only reason. Preheat the oven to 180ºC/350ºF; line two large baking sheets with baking paper. In a dry bowl, whisk together the flour, baking soda and salt. Set aside. Place the butter in the bowl of the stand mixer with the paddle attachment and beat on medium speed for 1 minute. Add the sugar and beat on medium-high speed until the mixture becomes fluffy and lighter in color, approximately 5 minutes. Add the dark brown sugar and continue creaming for 3-4 minutes, stopping the mixer occasionally to scrape down the sides of the bowl. Turn the mixer down to slow speed, add the eggs and egg white, one at a time, and continue to beat until they are fully incorporated and the batter looks smooth and glossy, 1-2 minutes. Add the dry mixture and the oats all at once to the butter mixture. Using a butter spatula, fold together for a few turns. With the mixer on slow speed, mix the dough until thoroughly combined, 1 minute. Add the chopped chocolate and the raisins. Scrape down the sides of the bowl with a rubber spatula and mix for another 30 seconds. The dough can be made up to this point and refrigerated, well wrapped, for up to 3 days. Using 2 teaspoons scoop the dough into mounds and place 5cm (2in) onto prepared sheets (I shaped the dough into a ball using my palms). Bake the cookies until they spread, rise, and turn a light golden brown, 12-15 minutes. Remove from the oven and let cool on the sheets. The cookies can be kept in an airtight container, in room temperature, for 4 days. Ooh, I would have hard time resisting that gorgeous cover! And the cookies look so yummy! Delicious recipe...and thanks for the tip on that wonderful book. Oh did you receive my email??? Funny, I used to love going shopping all the time, too. But now I just get frustrated in busy places. Unless it's a book store. I could spend hours browsing. Lovely cookies. Nothing like getting a new book and baking something from it! Yay for a golden raisin user. I like them so much more than the dark ones. 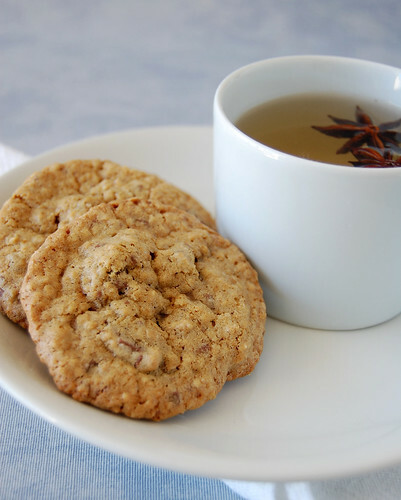 Now I'm craving for oatmeal cookies...these look so yummy and that book look gorgeous! Gala, I will! Thank you! Future Grown-up, I'm glad you like it! Julia, I don't like busy places, either. I feel suffocated! 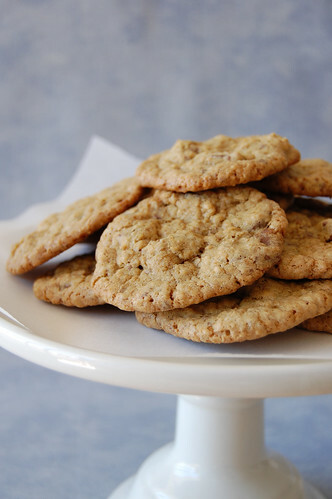 I love the addition of chocolate to this oatmeal raisin cookie! Great choice, and great book!